So, If you’ve been following movie trailers for some time, you may have noticed that the previews for Logan have teased a young girl with Wolverine’s power set. Fans will recognize her as Laura Kinney; aka. X-23 – an attempt by the Weapon-X program that gave Wolvie’s skeleton its adamantium chrome job to genetically re-engineer him through cloning (they couldn’t salvage the y-chromosome from his samples; hence why she’s a girl). Now, I’ve expressed my love of legacy heroes in the past, but I feel that most don’t get why Marvel is keen on gender and/or race swapping their classic roster. The answer is shockingly simple; they’re in the movie business now. Actors rarely want to spend their lives in the same roles forever and those who do reasonably can’t; they grow too old for the part or pass away and have to leave the role to another – essentially creating a legacy of their own. By test running huge shifts in appearance and perspective in comics (an industry that is much smaller and less risky than film), Marvel is testing the waters beforehand and prepping for when an actor may leave the studio. We’re already starting to see hints of this in the MCU films with Iron Man 3 setting up Pepper Potts as the new heroine Rescue. So, while we’re refreshing the roster, I thought I’d discuss some legacy heroes in the Marvel canon that I’d like to see in the movies. Getting her in the roster wouldn’t be too much of a STRETCH. Well, now that we have Carol Danvers, the original Ms. Marvel taking up the mantle of her less memorable male counterpart, we have an empty space to fill. I’ve said that the problem with the old superheroes is that they represent a mode of thinking from a by-gone age. So, it’s refreshing to see a young face providing a new perspective of the world, especially one from a more ethnic point of view. Let’s be honest with ourselves, comics have always a diversity problem and I applaud Marvel for being the front-runners in trying to set that issue straight. And with all of the anti-Muslim sentiment we’ve been exposed to lately, someone like Kamala – who is just a fun character to work with in her own right – could help to lighten up people’s attitudes. American pride status: restored via badassery. Most stories involving Captian America seem to come off as cynical lately. That’s because most of us aren’t happy with how our country is turning out and he comes off as an anachronism. What we need is a Cap that is less a product of the past than they are someone reacting to the past and wanting to improve the future. Fortunately for us, there’s a cornucopia of star-spangled soldiers out there to chose from. Josiah X (born Josiah al hajj Saddiq) is the son of Isaiah Bradley; most famously known as “The Black Captain America.” Josiah has seen America from multiple angles; as a soldier in Vietnam, as a former Black Panther (the society, not the African superhero), and as a vigilante breaking up gangs and drug dealers in the city. Josiah could bring a new globally-minded perspective that could benefit the story and the teams he works with. Sure, Falcon is being set up as the next Cap, but there’s nothing saying Josiah couldn’t play Bucky Barnes to his Steve Rogers. This is the last thing you’ll see before becoming a greasy smear on the wall behind you. I won’t lie, this is less about cultural significance than it is that I just f***ing love Danielle. For the record, Danielle is probably one of the least likely people to be introduced into the MCU due to the fact that she is a product of writers playing with alternate timelines (and look at how well that played out for Fox), but I adore her as an absolute badass character born from two equally badass parents; Luke Cage and Jessica Jones. Who knows? Maybe after they wrap up this universe-spanning series of films, they’ll start a new series with Danielle and her future Avengers. Even the almighty need help sometimes. Those of you who make it a point searching the internet for any fascinating nugget of anything like I do may have seen a comic making the rounds lately. Not long ago, io9 did an article on a (somewhat NSFW) comic dubbed The Gaeneviad, written and drawn by a French artist known simply as Boulet who produces a special comic once a year in a mere 24 hours; an impressive feat to be sure. While I’m happy for having the comic brought to my attention, I was disappointed as I felt the original article might have missed some critical points of interest. I believe there is a lot to be gleamed from this story and I want to through and share the details I noticed in this heartfelt comedy. My first act of research involved finding the significance of the title. However, every attempt to find a translation or the meaning of ‘Gaeneviad’ redirected me to the name Genevieve – the name of our elderly protagonist. The theme of heroism is also what dictates the modernized Olympian setting. Although the ancient Greeks were far from the first to use the heroic myth narrative, they tend to be the first we, as the common person, think of. Most western fantasy epics use the model of Greek mythology. Many of us refer to comic book superheros as the modern Greek heroes. But in a sly twist, this isn’t your standard Hero’s Journey yarn. Rather, it’s a critique of so-called “heroes”. In The Gaeneviad, Zeus sends the world into chaos to protect Genevieve from harm, even when Hades comes to collect her soul (Aside: I like how Hades is portrayed in his traditional keeper of the dead role rather then his more modern Satan-Stand-In model). 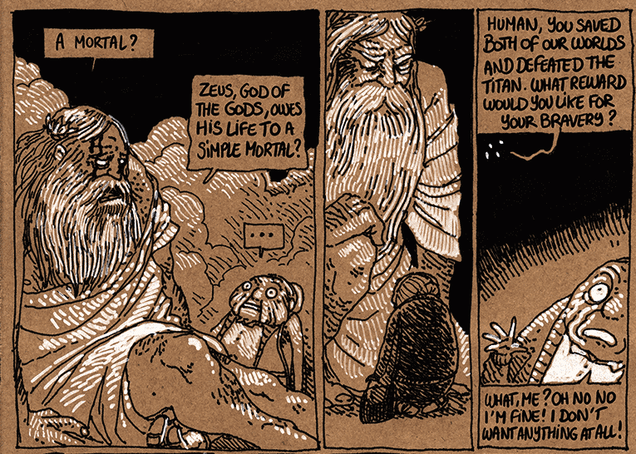 When asked by Hades at the end of the comic why he went so far out of his way to protect and serve her, Zeus responds saying, “Because heroes are assholes.” He then laments how rare true altruism is and how what we consider acts of heroism are often motivated my some self-serving goal. This was a beautiful and yet hilarious piece of sequential art that I was happy to find and even happier to share. Sometimes, we don’t need heroes; we just need one decent person. I’ve… got nothing. The picture says it all. Instead of a regular article today (class work and other obligations are whipping my ample buttocks this week), I thought I’d ask a question of my readers. We all need a figure to look up to and admire. When normal people in the real world just can’t do the things we want to aspire to, we look to tales of fantasy for inspiration, guidance and strength. The stories that we hear and share with one another have served as a guide to how we want to live our lives. I would have to say my first fictional role model was one Daria Morgendorffer. When I first starting watching the show in the mid to late 90’s, I was accustomed to routine ridicule and even physical violence for being the geek of the class. Daria was the first person I could think of that was similarly ostracized from the crowd for preferring to keep to herself and think rather than blindly follow social norms without questioning them; a “Brain,” as she would call herself. I saw her as strong and realized that I needed to continue on my own path without the rest of the crowd because what worked for them – popular trends, fashion, and mindless socializing without any real communication – could not possibly work for someone like me who thought about his world a bit to much for his own good. And that’s what I want to talk about today. What characters in fiction do you look up to? A comic book superhero? A figure from one of your childhood fairy tales? What life lessons did they teach you? Answer the poll below and comment below so we can share our stories, learn from each others icons, and feel good.